Home » squirrel proof bird feeder tips » Why Squirrel Proof Bird Feeder Poles Are So Important? Ultimate tips inside. Why Squirrel Proof Bird Feeder Poles Are So Important? Ultimate tips inside. The truth is I have already tried to compile Internet's most comprehensive collection of squirrel proof bird feeder tips and it seems people find it very helpful. Yes, I think did a good job... but somehow, I have an impression that so far I've failed to stress enough just how important is to avoid mistakes when choosing feeder pole! I failed probably because one can't stress that enough... Now, as a mean of redemption, I will try to put together some advice on how to choose proper pole for squirrel proof bird feeders. 2. Great feeder pole will contribute to squirrel proof properties of just ANY bird feeder no matter if the feeder is the top anti-squirrel quality right out of the box or DIY bird feeder improvised from beans can. If you are not quite sure what I'm ranting about here, please just remember that feeder pole is either squirrel proof friendly or squirrel friendly! OK, now that we know that feeder pole is feeder's biggest aide, let's pick the best pole to keep those squirrels out from bird food. 1. The height of the pole is crucial. Never choose short poles because some "talented" squirrels out there are able to jump almost 5 feet straight up. Always go for poles from 8 feet and up - that should do the trick. Please check my 8 foot bird feeder pole article on this matter. 2. Never underestimate the power of squirrel baffle. Squirrels can and eventually will find the way to climb any pole and reach the food, while baffle makes it almost impossible. So in case your feeder pole is not already equipped, go and get the baffle and do not give it a second thought. 3. Danger from squirrel attacks also comes from above, position your pole properly. Move it away from any tall objects, backyard inventory, trees, walls, log piles, roofs, etc. Put it somewhere with plenty of clean space around. That way the squirrels won't have a chance of side jump on feeder. 4. Avoid mounting and maintenance hustle. Feeder poles are required to ease your love for birds and not to complicate it. So, try and find the feeder pole that's easy to mount to the ground and easy to relocate in no time. I personally like poles with ground anchor screws. It feels much better than digging around in backyard every time the pole needs to be moved for any reason. Also, try to pick good quality pole at the very start. I know quality comes with price, but you don't want to to be sanding and repainting those poles twice per year, right? 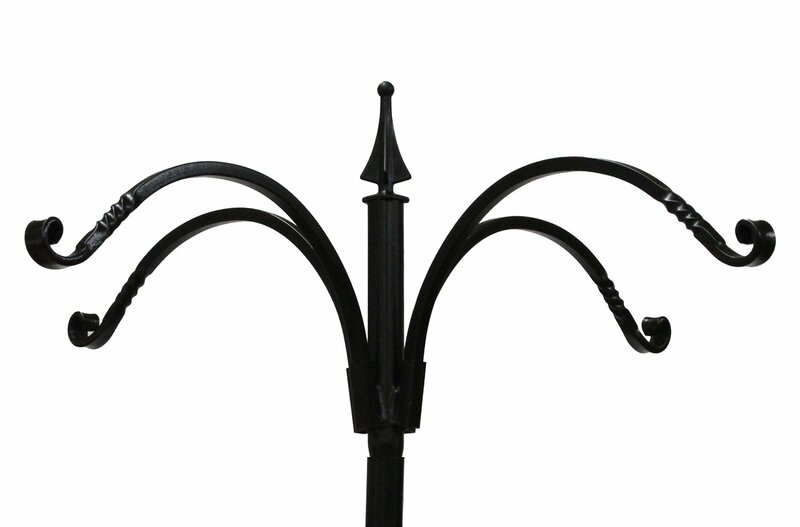 Durable powder coated steel poles are usually good choice. 5. The last, but not the least - pole should be nice looking and I really dig those stylish "coat hanger stand" poles like the one I have been showcasing here (pic to the left). If you like it as well, you may want to check if it is available for sale at this Amazon.com link. I strongly recommend checking all of its features. In fact, it's awesome bird feeder pole. Unfortunately, at the end I must conclude that from all available feeder poles in the market, just a few actually qualify for "squirrel proof" title. It's probably because of the pole producers who do not pay much attention to that feature thinking it is all up to feeder. But it is not. Please check below the poles and baffles I recommend. You'd also may want to find more about the anti squirrel baffles for bird feeders.